I love transforming favorite foods into new recipes. Using familiar flavors in a new way is an exciting way to mix up meal time. 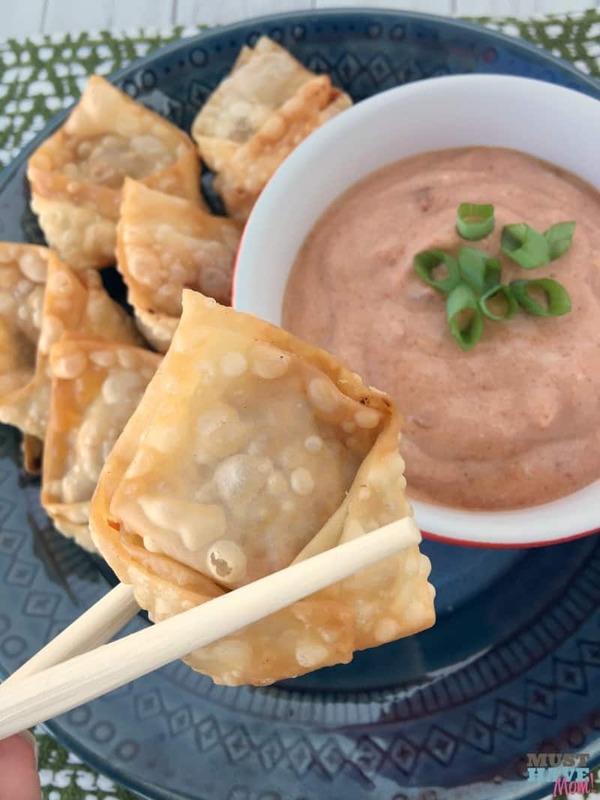 These kid friendly American wontons with sloppy joe dipping sauce take a Chinese favorite and twists the recipe into a fun mix of Chinese and American flavors. A great way to get kids to try new things is to pair familiar flavors they already love with new recipes and ingredients. I took the American favorite, the sloppy joe, and transformed it into an American wonton with sloppy joe dipping sauce. It has flavors reminiscent of your favorite sloppy joe but in a totally new way! These were so good that my toddler was literally eating the sloppy joe dipping sauce with his fingers, sans wonton. He at four wontons too! 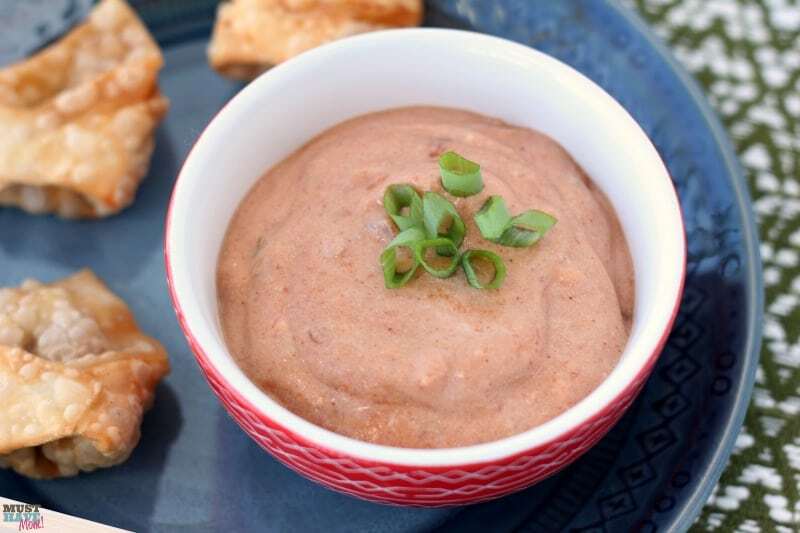 It was a huge hit and we all know how much kids love to eat anything they can dip! 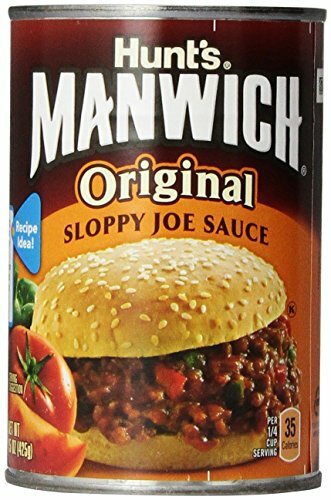 For this recipe I turned to our favorite sloppy joe sauce, Manwich and I used their thick & chunky variety. This is a great way to add some extra veggies in the wontons as well as a great base to hold your meat mixture together. Here are all of the supplies you’ll need for this recipe so you can order them now or check to make sure you have them! Begin by browning 1# pork (or ground beef) in a skillet (I like this one) until no longer pink. Drain any grease and dump into a bowl. Add in 1/2 cup Manwich Thick & Chunky sloppy joe sauce, 1/2 cup carrot matchsticks, 1/4 cup water chestnuts, and 1/4 tsp black pepper and mix together. Then place a small dollop of meat mixture into the center of a wonton wrapper. 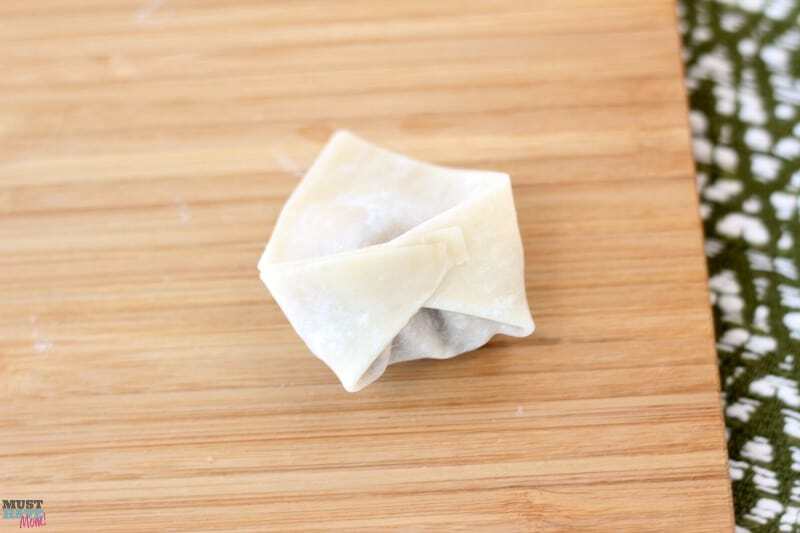 Dip your finger in water and run it along the edges of the wonton wrapper. 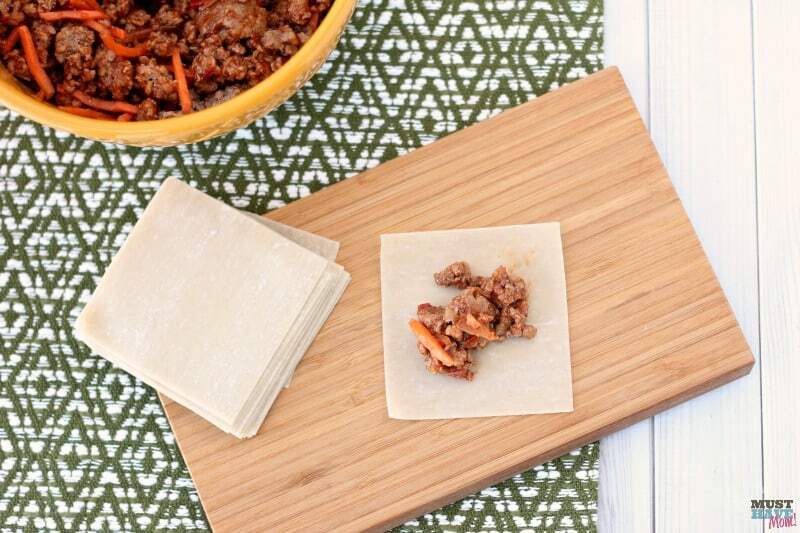 Make sure you don’t put too much meat on the wonton wrapper or it will tear and be difficult to work with. Now fold it over to create a triangle. Press the edges together to seal them. Next, place a drop of water on the bottom left corner of your triangle (using your finger) and then pull both corners together and press to seal them. The wet corner should be underneath the dry one so it seals. Repeat this until all of your meat mixture is used up. 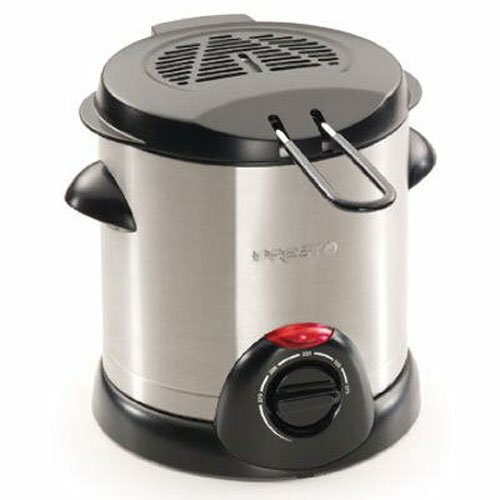 Fry the wontons in a deep fryer (we just use a small one like this) until golden brown (about 2-3 minutes). 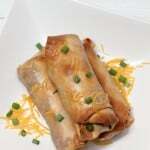 Pull them out and place on a paper towel-lined baking sheet or plate. With your remaining sloppy joe sauce you will make your sloppy joe dipping sauce. Mix one part sloppy joe sauce with one part plain greek yogurt. Stir together. Top with green onions for added flavor! 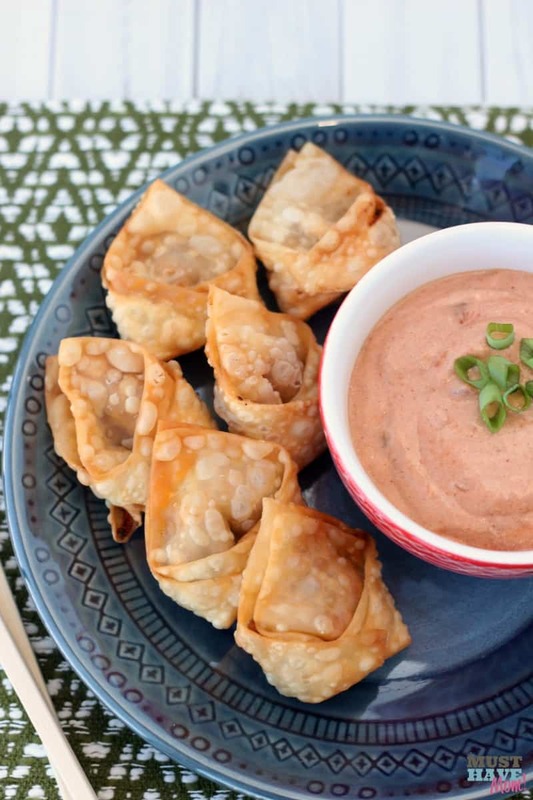 Serve wontons warm with the sloppy joe dipping sauce. Kids LOVE dipping just about anything so these are sure to be a hit. Finger food is always a bonus in our house! 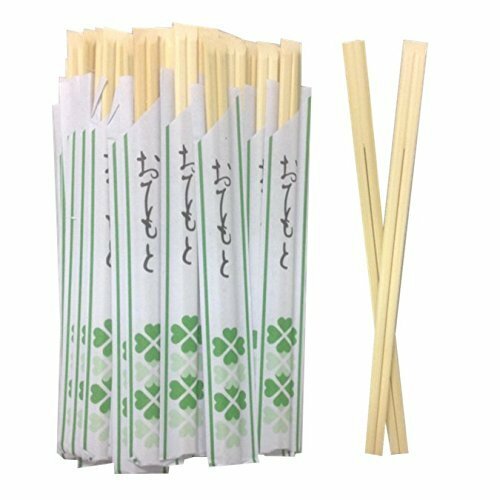 Break out the chopsticks if you’d like to give your kids an added experience. It’s fun to try new things. By combining familiar flavors, like sloppy joe sauce, with new ingredients they will be more willing to try something new! Want more fun twists on the favorite sloppy joe? Check out Manwich for recipes and more! Kid friendly recipe using familiar flavors to try new things! In a large skillet brown pork until no longer pink. Drain grease and dump in a medium size bowl. Add Manwich sauce, carrots, water chestnuts, and black pepper and mix well to combine. Place dollup of meat mixture onto the center of wonton wrapper. Dip finger in water and run along the edges of the wonton. 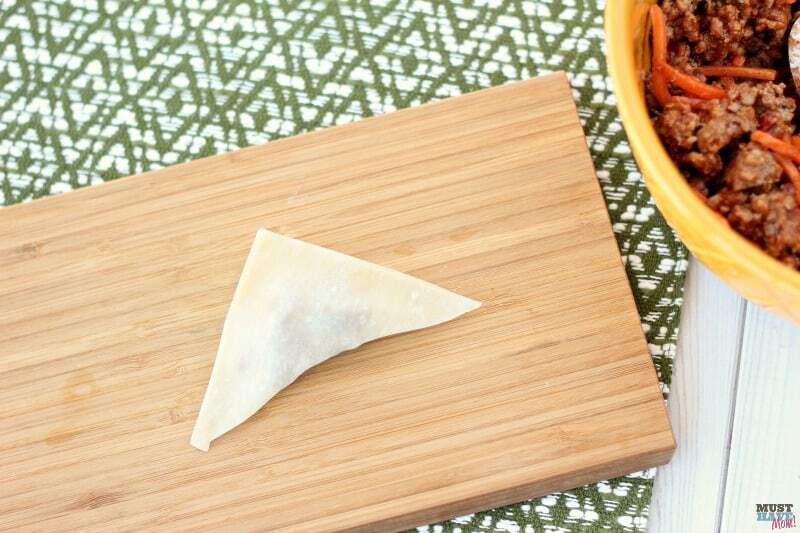 Fold wonton over to make a triangle. Press the edges to seal. Dab a little water on the bottom left corner and then pull it up and fold over the opposite corner and press to seal. Fry in hot oil until golden brown (about 2-3 minutes). 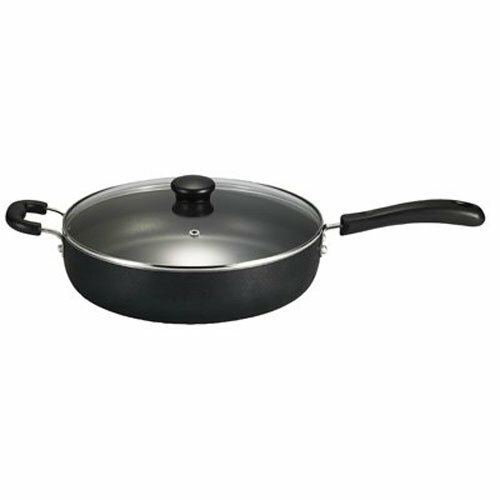 Remove from oil and place on a paper towel-lined pan to cool slightly. Serve warm. 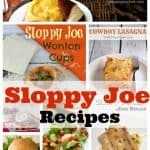 For sloppy joe dipping sauce combine remaining sloppy joe sauce with plain greek yogurt using a 1:1 ratio (ie-1/2 cup sloppy joe sauce and a 1/2 cup plain greek yogurt). Stir and serve with wontons. You may freeze any remaining wontons and simply heat them in the oven to serve. We love when you pin our recipes and share our posts on Facebook! Pin the image below to save this recipe for later. « Sunday Sweeps Giveaway Linky! 2/12/17 Edition! This is such a great idea. 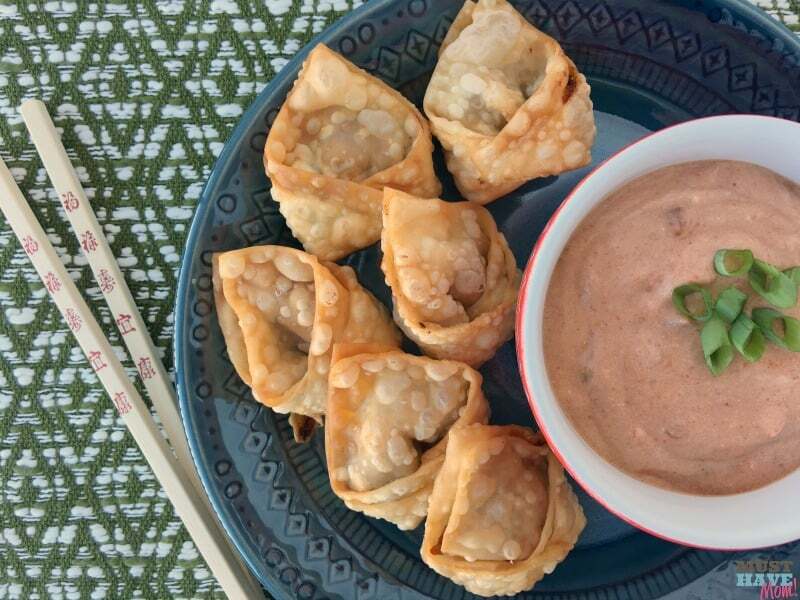 These wontons would also work as an appetizer. I’ll have to try these. Yes, they would make a great appetizer also. I’m thinking next big game day they will make an appearance. Oh my gosh yum! I want this for dinner tonight! This would be a great way to have a fun dinner without a lot of fuss! I will be trying this! 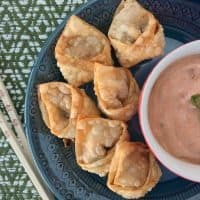 My kids love wontons and would think these are great. I must pin so that I can make it soon. These look really delicious! 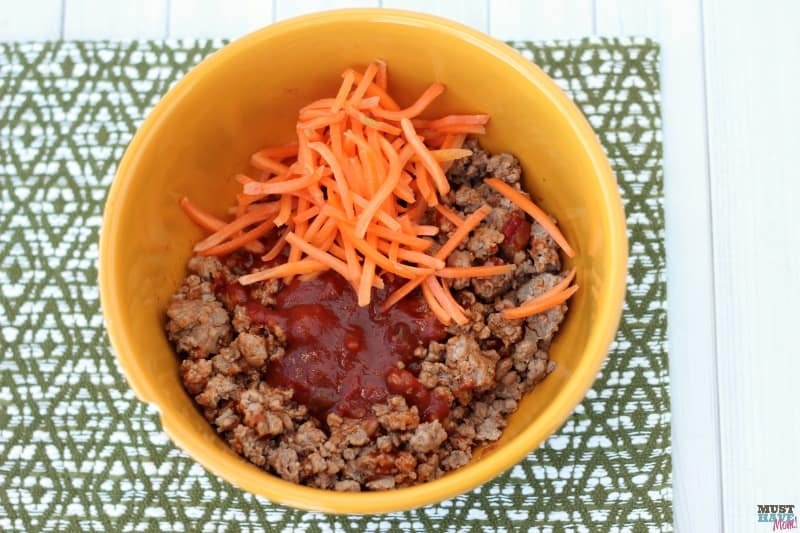 We love Sloppy Joes and these would definitely be perfect for the kids. Even though I don’t have kids, this still looks like something that I would enjoy. I am going to have to make this for me and my husband. I think these look so good! I am sure my kiddos would love these too! I am excited to give this recipe a try. My kids are going to love them. 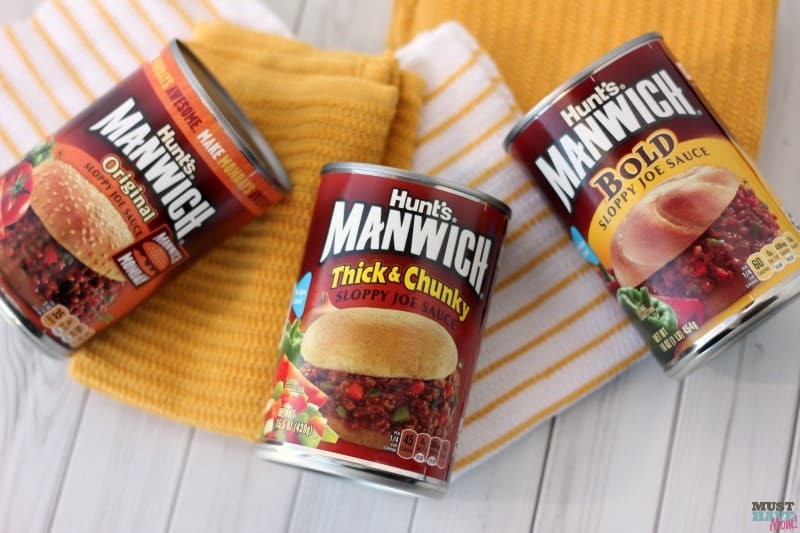 Manwich is a great way to make a delicious dinner in minutes. This is a great recipe to get the kids to help with. I will have to get the ingredients I need to make some this weekend. Fun! This is definitely a clever sloppy Joe idea. I think the family would love the change of pace! Our grands are going to love this! I have a feeling that my kids would love these. I can’t wait to try it out. Super creative recipe! This is a great idea! My kids will surely love these! I can’t wait to try! What a great idea. How can you go wrong with sloppy joes. what a clever idea! 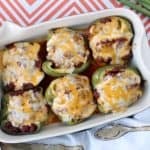 These would make a great appetizer for a party! 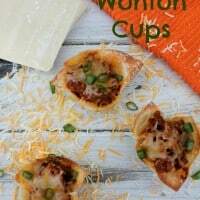 The Kid Friendly American Wontons With Sloppy Joe Dipping Sauce Recipe looks so delicious and fun to make with my kids. They would love to try this recipe and so would I!